The PS28 is the simplest and easiest to use night vision scope ever designed. The PS28 is what is known as a "clip on scope", or a "day/night system." 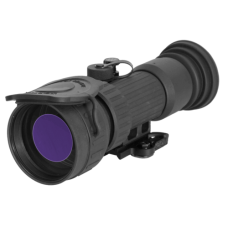 The main benefit of a clip on scope over a traditional night vision scope is the convenience of the clip on scope. The clip on scope easily clips on to your weapons rail, in front of your regular day time scope. This means that you neither have to re-zero your scope, nor do you have to remove your normal daytime scope in order to install this one, as this one just "clips on," right in front of it. Even though the PS28 is designed to be convenient and easy for any user, it provides the quality night vision experience one would expect from only the highest end professional devices. One of ATN's toughest devices, it is intended to survive even the harshest and most severe weather conditions. It also comes with a quick release mount for when the situation changes rapidly, and your device needs to adapt. 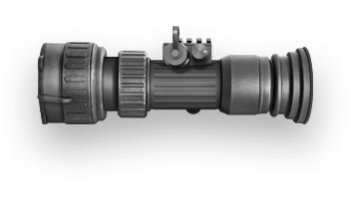 The PS28 is one of ATN's most versatile and easiest to use scopes, and its only night vision clip on scope.